We've been going through a major habanero tequila + grapefruit juice phase for the last few months, so it only seemed natural to package some up as Christmas gifts. Oh, and those little peppers there? Not purchased as photographic props, I promise. We're replenishing our personal supply this week. We managed to co-design a wrap around label that includes the recipe for the drink. We only argued about fonts/spacing once. Mostly because we were both too tired to keep going. We were working from this recipe. It's great, but we've learned a few tricks. Start with a decent affordable tequila. You don't want an anejo for this, mostly because it would be a waste of aged tequila. We used a Cazadores reposado, although I'd like to try it with a blanco soon. Taste your peppers before you use them. Not all peppers are created equal and every once in a while you get a crazy hot one. Take a tiny bite first, and then decide how to handle it (you can reduce the steeping time, or you can remove almost all of the seeds - both will help). 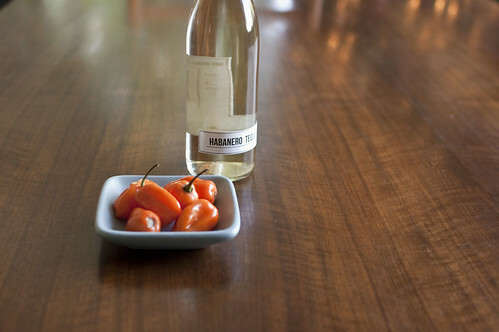 Set a timer and taste every hour to make sure you aren't going beyond your spiciness tolerance. If it accidentally goes too far, you can mix it with regular tequila to help balance it out. Highly recommend using only unsweetened pink grapefruit juice. This could be my prejudice against sweet cocktails, but I think the strong flavor from the grapefruit is all you need. No sugar here. The recipe is for a large batch. We basically break it down into parts so we can scale it. They recommend a 1:3 ratio of alcohol to juice, but you'll want to see where you like it. I'll sometimes do 1:3 but other times go for a 1:2. A normal drink has 2 oz of alcohol (1/4 cup). Oh, and I used these bottles for packaging. I can promise you that I checked every website known to man and this ended up being the best balance of price + shipping. It drives me nuts when shipping is almost as much as the product, but I guess you can't really get away from that when you're purchasing glass. So cool! I want one and I'm jealous you know how to make this. wow. this is one of the coolest diy i've ever seen - very neat idea. we've been loving that infusion recipe as well! though we've, er, started leaving the peppers in our jar of hooch overnight. capsaicin is good for you? we also throw the peppers in salsa afterward - gives it a nice pickly bite. Wow, these sound delicious! Now I know just what to do with those 3 bottles of tequila I have left over from our last party...thanks! That looks so good! I don't like grapefruit juice, but I've had jalapeno tequila with pineapple juice -- delicious! This fall, I had a habenero/jalepeno tequila cocktail with grapefruit juice at Fifty-Fifty Five, in Portland ME. It was delicious but took me about an hour to drink. They evidently hadn't tasted for crazysuperhotrenegade peppers. Love the recipe! Maybe I can recreate it at home without blowing off the roof of my mouth this time. This is such a great idea--I wish I had read this before Christmas I think lots of people would have happily received these. And I love the label too! This is seriously off the hook. Awesome! I have a feeling infusing his own liquor will be next on my hubby's list of kitchen challenges to conquer. Funny story: At the Dragonfly Cocktail Cabin in Crested Butte, CO while on our honeymoon last year, my hubby had the most delicious Habanero & Pineapple cocktail. He, of course, promptly tried to recreate it when we were back at home. One for whom more spice is always better, he used so much habanero on one batch that he burned blisters on the inside of his mouth! So cute! I made Cranberry infused Vodka for X-mas presents. 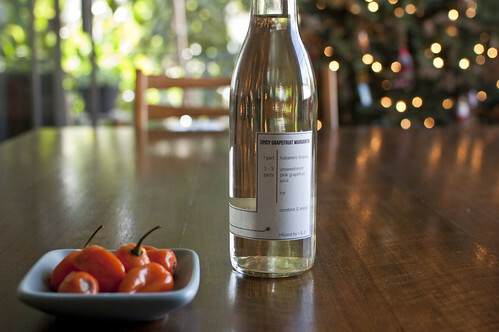 Do you cut the peppers while infusing the tequila or drop them in whole? I'm thinking this would be a perfect valentine's gift for my hubby! Fantastic idea for a gift! I've always wanted to try making my own spirits...or a variation of them. @ lauren - you guys are INTENSE. we've had a couple of three hour batches that nearly blew the tops of our heads off, and we are generally pretty into spice. @ Davin - cake filling! @ Kristen K - you cut the peppers in half. and remove the seeds as well if you want it less spicy. the original recipe has more details! That sounds so delicious! A friend of mine made Turkish delight infused vodka as a Christmas gift which I'm dying to recreate too. I'm totally geeking out on the Specialty Bottle site, thinking about all the fun gifts I can make and ways to improve my kitchen storage. Thank you so much for sharing! This is great. We put a whole sliced fresh pineapple in a large glass dispenser, add tequila and habaneros and let set for 8 days. Fantastic! Finally getting around to making this. I'm two hours in (to infusing, to TASTING) and was considering the whole adventure a solid +1 for the day. Then Jodie ate the extra habanero. Yeah, that would put a damper on things! Hopefully everyone survived? I would love to make this for Christmas this year! Wondering if you have a PDF for your label OR some insight on how to make my own?! Thanks! I used Adobe Illustrator, but I know that most people don't have that program. You can work in PowerPoint, but I find it a little frustrating. Let me see if I have a PDF of our label and maybe I can get it posted here this week.